Here at CNEWA, our New York office will be closed until Wednesday to mark the Independence Day holiday. But if you’re looking for news, photos, videos and insights from the world we serve, look no further. 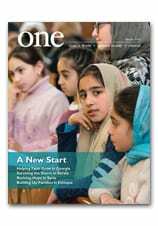 The June edition of our award-winning magazine, ONE, is now available online. Recently honored with a record 31 awards from the Catholic Press Association, ONE continues to bring stories of inspiration, courage, faith and hope to our readers and donors. This edition features a cover story about excellent Catholic schools in Ethiopia; we also take readers to a city in Lebanon offering welcome and hope to refugees and see how Caritas (with support from CNEWA) is helping the poorest of the poor, both young and old, in Armenia. For more insight, take a moment to watch this video preview from Msgr. John E. Kozar below. Meantime, have a safe and happy holiday weekend — and thank you for your continued readership and support! In this image from 2016, a volunteer embraces refugee children at a makeshift camp in near Idomeni, Greece. The Holy See has called for financial donations to developing countries to go toward supporting migrants, refugees and the local poor. He figured everyone knew the best church music was contemporary. He was sure there was a 45-minute pastor’s sermon at the heart of every Sunday service. And didn’t all Christians agree that religious art, symbols and rituals were relics of a less desirable past? Then he encountered the ancient faith that would change his life. Gilbert is neither ethnically nor culturally Greek — his forebears came to America from the British Isles. But after discernment and years of study, he’s now the Rev. Gregory Gilbert, the presiding priest of Sts. Mary Magdalene and Markella Greek Orthodox Church in Darlington — and a prominent example of the gradual but insistent wave of conversion that is turning a tradition long rooted in ethnic heritage into a more varied and, some say, more American movement. Almost half the nearly 1 million Orthodox Christians in the United States today are converts, the Assembly of Canonical Orthodox Bishops of the United States of America reported in 2015. The majority of these married into the church. But a growing number are joining simply out of an affinity for the faith. Continue reading at the link. You’ll also find a gallery of photos and a video. Lebanese Cardinal Bechara Peter Rai consecrated Lebanon and all the Middle East to Mary in Fatima, praying for peace and stability. Thousands of faithful from the Middle East as well as Lebanese diaspora from around the world also made the pilgrimage for the “Lebanon Day in Fatima,” which began 24 June with the recitation of the rosary and a candlelit procession. “We have come from Lebanon, Iraq, Syria, the Holy Land, Egypt, the (Persian) Gulf countries and various countries of proliferation — particularly from Australia, Canada, the United States, Europe — to continue, from generation to generation, to honor our Blessed Virgin Mary,” the patriarch said during his homily 25 June. He concelebrated Mass with Syriac Catholic Patriarch Ignace Joseph III Younan and a delegation of bishops and priests. “We have come to renew the dedication of Lebanon and the countries of the Middle East to the Immaculate Heart of Mary, according to her wishes. This dedication is to repent, to stop wars and to consolidate peace,” Cardinal Rai said. Beginning in June 2013, the patriarch has annually consecrated Lebanon and all the Middle East to Mary at Harissa, home of Our Lady of Lebanon. The consecrations were in response to a request of the Synod of Bishops for the Middle East held in the Vatican in October 2012. This year, the consecration at Fatima commemorated the centennial of the apparitions, when Mary appeared to three shepherd children in the Portuguese village. About 40 percent of the approximate 4 million Lebanese citizens residing in Lebanon are Christian. Lebanon has the only Christian head of state in the entire Middle East and North Africa. Under Lebanon’s power-sharing system, the presidency is reserved for a Maronite Catholic, while the prime minister is a Sunni Muslim, and the speaker of parliament is a Shiite Muslim. Christian Scout volunteers turned out on 18 June to paint parts of Aleppo, Syria. Never have Aleppines found the markings on their sidewalks more beautiful. The Franciscan parish in the large city in Northern Syria decided to restore the city’s colors. Aleppines could not believe it when on Sunday, 18 June, they saw scout brigades repainting their sidewalks for the first time. A little black and white paint was enough to give color to the neighborhood around the parish of St. Francis of Aleppo. A municipal sign indicated to drivers whether they were allowed to park their cars or not. It is the most trivial of things and yet “It is beautiful,” said one passer-by. “Aleppo more beautiful” is an initiative carried out by the local friars of the Custody with the support of the governor, the mayor and the whole municipality. The program was inaugurated on Sunday, 18 June. In front of the parish church, Father Ibrahim, the pastor, was surrounded by government officials, brushes in hand, to paint the edges of the sidewalks. Volunteers were happy to be covered with paint — and to be covering the streets, too. The promoters of the initiative invited all of the churches to join them and many groups such as the Christian Scouts, various religious groups and any of the inhabitants of the city who wanted to help. The Latin parish took charge of the financial aspect by buying all of the necessary materials. In the end, more than 200 people, armed with paintbrushes, buckets and paint, showed great enthusiasm and zeal and set out to conquer the city by embellishing it. Read more and see more pictures at the link. Pope Francis meets with a delegation from the Ecumenical Patriarchate at the Vatican.